We now get to the best part of our KK trip. 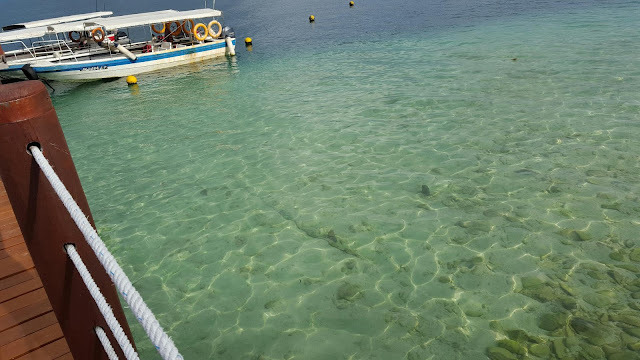 To be honest, our island hopping session turned out to be far better than expected. We had no initial plans. Just a general idea that we'd like to go island hopping if we had the time, no pressure, a rough idea on mode of transportation to the islands (initial idea was to be thankful if we could even visit one of the islands) and seriously, with no advanced planning we didn't know whether the tour would be enjoyable in the least but worth the try I guessed. 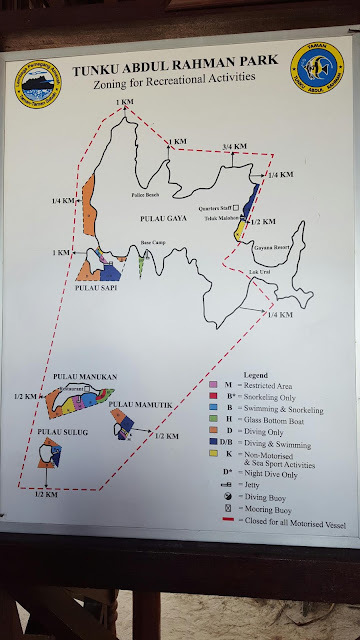 I gave the office at the Jesselton Jetty a call that particular morning after breakfast to get the necessary info such as boat departure times and costs. They told us to come down to the jetty asap, which lucky for us was only within walking distance from the hotel. 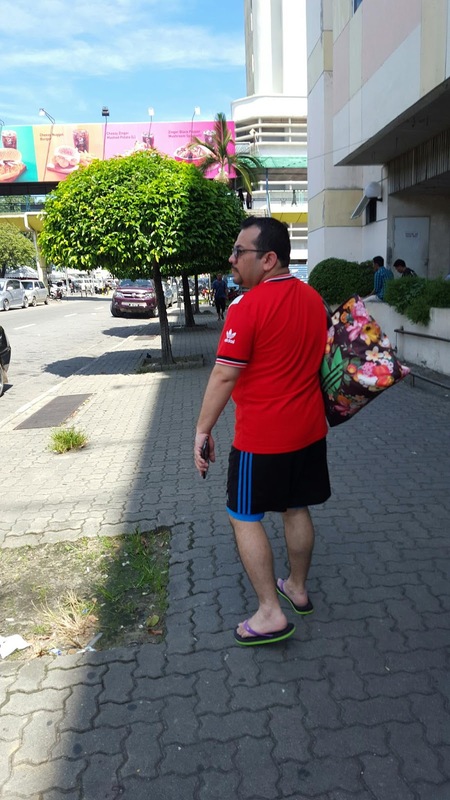 Here's Hubs looking flashy with my flowery Adidas bag. All the way to the Jetty he was complaining how ridiculous he looked carrying it. Only later that day he actually appreciated the fact how useful that flowery bag was with how much stuff could fit into it for our island hopping getaway. On the way though, we got even luckier to have met Shah, the guy that we chartered a private speedboat for ourselves for the day. 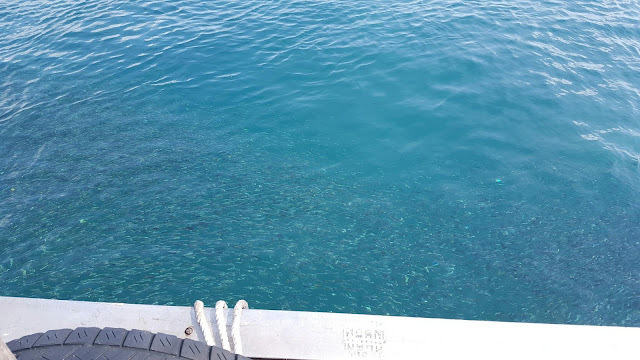 To boot, the price which was absolutely worth it, took us to to the main three islands of Tunku Abdul Rahman Marine Park namely Mamutik, Manukan and Sapi. From KK, it probably took us 15-20 minutes to get to the first island. I would definitely recommend chartering a private speedboat to skip all the waiting time and queues. It saves time and you won't get stressed when you decide to go off to the next island. Queues tend to be very long and we could see the many dissatisfied faces as well as frustrated parents with their kids in tow when we went straight ahead to our chartered speedboat. Unlike us, they had to go through the hassle of waiting for their turn to get on their respective speedboats with hoards of people aboard. Even to push off, those boats which took in groups won't leave until all those in the group are aboard. So more waiting time i.e. wasted time when you could enjoy skipping off to the next island. 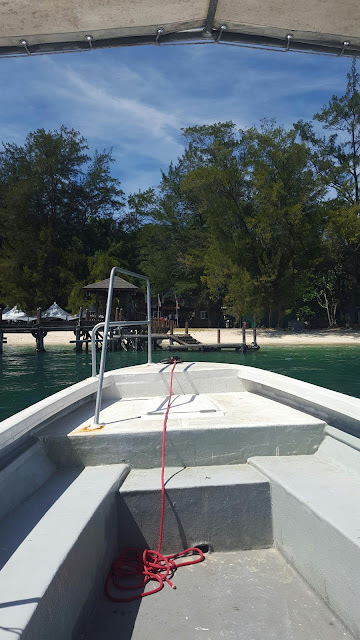 Here we are, at our first stop for the day, Mamutik Island. 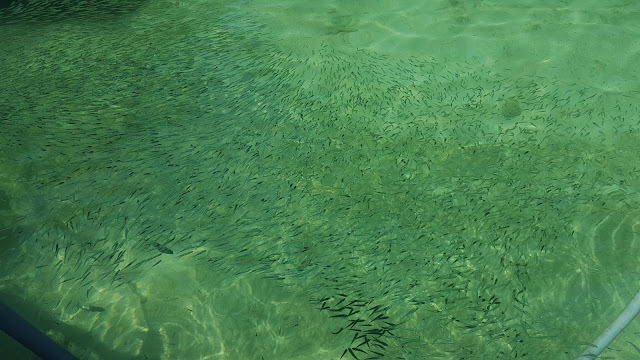 The water was so clear you can see all the cute fishies. This was just at the jetty alone. 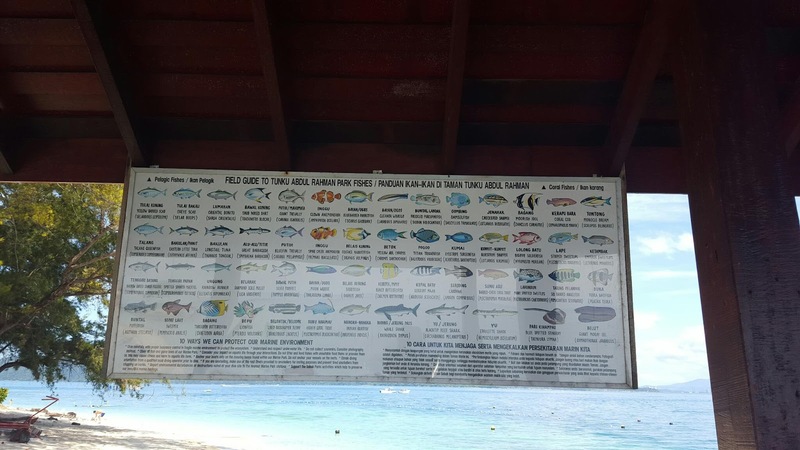 There's a guide to the type of fish tourists may encounter at the Marine Park. 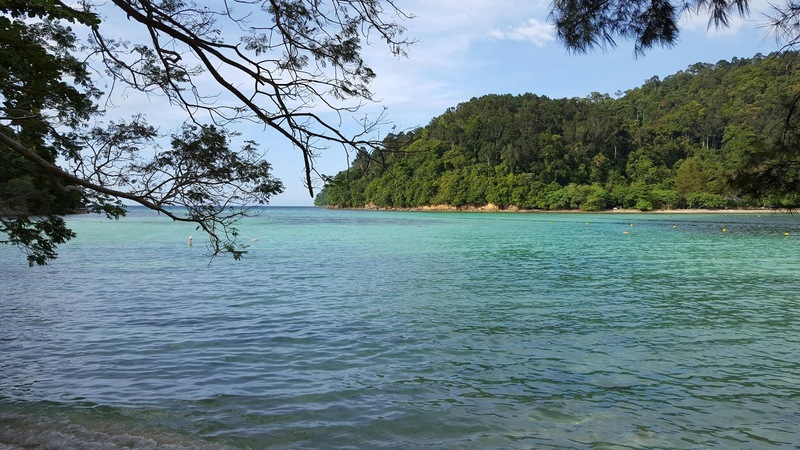 Oh, for adults, entrance fee is RM3 per person upon which you'd get access to all three islands. Here's a map of the Marine Park. A view from the jetty at our second island of the day, Manukan Island. 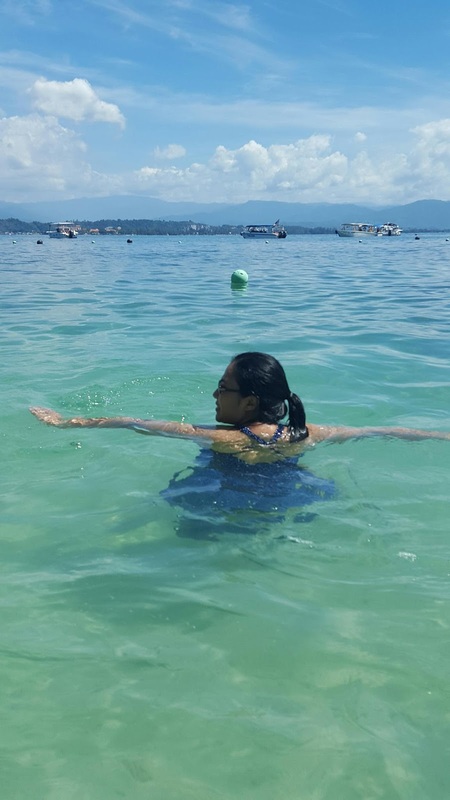 This was taken in Sapi Island. Our last stop for the day. What I discovered, and this is my personal view, is that each island has a different shade of colour. This in reference to their waters. All are clear and clean mind you. However, the shade of colours are either mainly green, mainly blue or a mixture of blue and green. So pay a visit to the islands and discover it for yourselves. 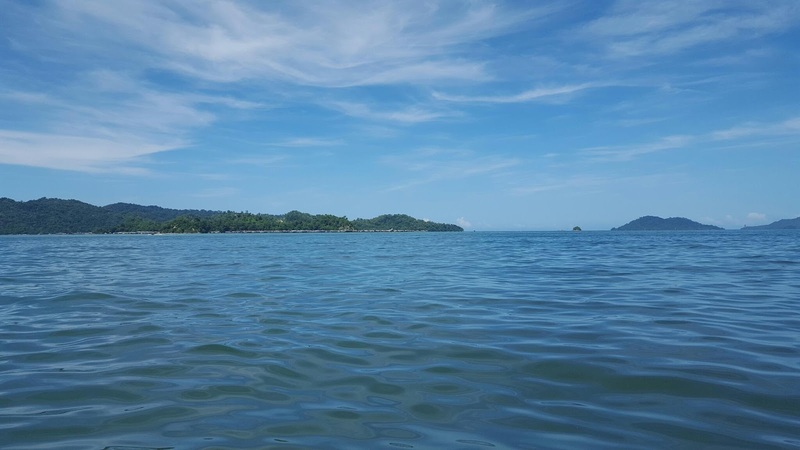 Definitely worth exploring our beautiful Malaysia. Ohh, don't forget to bring your snorkelling gear. We went ahead without any but managed to rent two for ourselves for the trip.